Bring a timeless design to your dining space with the Alekto Dining Table. Rectangular in shape, it is supported by a trestle base and features a mirrored apron. Each end support is accented with traditional turnings. 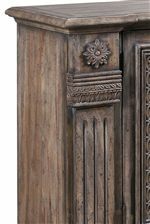 Woodwork features graceful proportions mixed with an aged patina finish, exuding evocative hues and adding charm and character to the piece. Included is one 20-inch leaf that allows you to extend the table from 82-inches to 102-inches to accomodate more visitors and guests. The Accentrics Home Alekto Rectangular Table by Pulaski Furniture at Belpre Furniture in the Belpre and Parkersburg, Mid Ohio Valley area area. Product availability may vary. Contact us for the most current availability on this product. 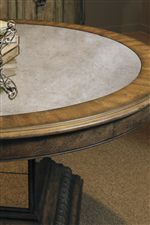 Leaves One 20" leaf extends table to 102"